Focusrite Clarett USB lays down the challenge to interfaces twice the price. The Clarett USB range features specially designed high performance, low-noise (-128dB EIN) mic pres with a low distortion, ultra-linear design that guarantees a clean, open and transparent sound, giving accurate representation of the original performance. Boasting 119dB dynamic range, Clarett can now be experienced with any Mac® or PC supporting USB 2.0 and above. Decades of analogue circuit design experience, applied around 24-bit/192kHz A-D and D-A conversion, delivers a superior signal path. The four Air-enabled mic preamps can reproduce the input impedance, clarity and frequency response curve of Focusrite's original ISA mic preamp. Clarett 2Pre USB connects to Mac® or PC using the included standard USB and USB Type-C™ cables. Record with super-low latency through amp simulators and effects plug-ins. SOS (Sound-On-Sound) awards 2019 - winner for best interface. “Clarett USB from @WeAreFocusrite has won the Sound on Sound ‘Best Interface’ award voted exclusively by their readers, "The process of choosing a USB interface just got harder, thanks to the arrival of another very strong contender. The USB Claretts offer the same excellent audio specifications as their Thunderbolt cousins, in a more universal connection format.“ "The process of choosing a USB interface just got harder, thanks to the arrival of another very strong contender. 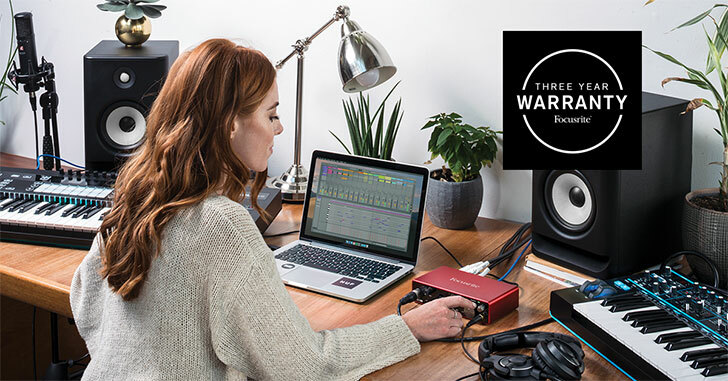 The USB Clarett’s offer the same excellent audio specifications as their Thunderbolt cousins, in a more universal connection format." – Sound on Sound on the @WeAreFocusriteClarett USB range. "Where Focusrite have laid down a challenge to other manufacturers, though, is in the sound quality of these devices, which offer audio specifications previously unheard-of in this price bracket." ”...the preamps are commendably clear and neutral..."
The @wearefocusriteClarett 4Pre USB was voted 9/10 by Future Music! ”Sonically, the Clarett 4Pre is an impressive design, and the Air option... we found particularly seductive on vocals and guitars. ”Sonically, the Clarett 4Pre is an impressive design, and the Air option... we found particularly seductive on vocals and guitars." ”Superb preamps... the sound quality produced across all eight analogue channels is beautiful." "good in a transparent way, little colouration but there seems to be a presence added that is hard to define but very positive and largely thanks to the ‘Air’ sound on the mic pres. This adds a clarity and power to vocals, emulating as it does, Focusrite’s ISA." "I also dug out a Prism Titan that we’re looking at thanks to its new found lower price tag, but it is still close to three times the cost of an 8Pre... I’d probably struggle to point one out above another every time in a blind test." ”...the unit has a pristine sound"